Create a cute daisy headband like the girl pups in our May Day Coloring Page have on. Perfect for May Day, Mother’s Day or even a tea party. 1. 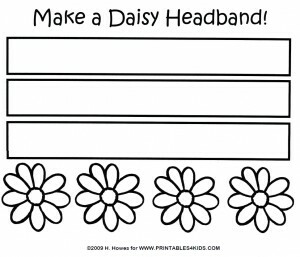 Click on image above to view and print full size or Download the Daisy Headband Craft Pattern as a PDF file. 2. Color the three strips. Cut them out and glue them end to end (will make one very long strip). Measure circumference of head and have an adult help cut off excess length. This will be used to create headband (head wreath). 3. Color the center of the daisies yellow. You can get extra daisy sheets here. Cut the daisies out and glue them onto the headband. 4. Get creative by curling the petals, overlapping the flowers, or add glitter and ribbon. Save on kid’s craft supplies at www.CreateForLess.com.